This incredibly fast and remarkably beautiful road race takes runners from the majestic mountains and pristine forests of Big Bear to the foothills of Redlands, California. Featuring a smooth downhill slope and spectacular scenery in the San Bernardino National Forest, this race will be sure to help you set your PR and finally hit that Boston Qualifying time. 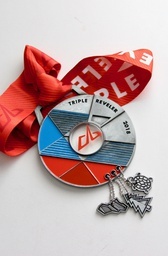 REVEL Big Bear is the fastest and most beautiful marathon and half marathon in California! REVEL in speed. REVEL in beauty. REVEL in Big Bear. REVEL Big Bear donates a portion of your registration fees directly to the Big Bear community as our way of giving back.